Are you looking to protect your family from health risks associated with dust and mold, and to protect your investment in your home? 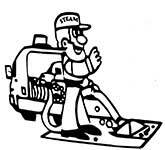 Experts recommend steam carpet cleaning a minimum of every 12 months. And Steam Master is one of the leaders in carpet cleaning. Our technicians are IICRC-certified and have the right equipment to handle any size job or damage scenario. We start by evaluating your carpet to determine which treatments will work best. Then we apply a pre-conditioner that flushes out dirt, residues and soils from the bottom of the pile and fibers. We use a powerful vacuum to remove the dirt, and then attack any remaining stains with just the right mix of chemical solution. When cleaning is finished, we groom your carpets combing the pile fibers, leaving a new appearance and resilience that you’ll love. Our quality and prices are unmatched and we’ll quote you an accurate price right up front. If we find anything in the course of cleaning your carpet that would result in extra charges, we’ll let you know up front. Steam Master Carpet & Upholstery, Inc is family-owned and operated.